The Carriage House is nestled in Old Town Safety Harbor. In 3 minutes you walk to the Pier on Tamps Bay, the Safety Harbor Resort and Spa, the Post Office and Starbucks. There are seven Restaurants within a 10 minute walk including the 'Almost Famous' Whistle Stop Grill where you will find outdoor seating , a laid back atmosphere and live music at least 3 nights per week.. The Carriage House' unique architecture and fenced back yard will make you feel like you stepped back in time..to a slower pace. ..Built in 1925 the Carriage House was originally just that- 'a carriage house 'not far from Green Springs Resort. It is the oldest wooden structure in Safety Harbor. Step out on the brick patio for breakfast and have a drink on the wood deck at night. The bedroom is a second floor large loft with a large window to view the Bay about 100 yds away. There is a working fireplace, TV and DVD, and a full kitchen. Guest Comment: Thank you so much for sharing your charming cottage. We felt transported to another place in time. So relaxing & peaceful. The cottage is decorated so lovely and the grounds are beautiful. You and your husband are wonderful hosts ,looking after every detail. Marley seems to know his role as the the 'darling dog' of The Carriage House. Thank you for our gift dinner at your awesome restaurant Whistle Stop Grill. We loved the place so much, we found ourselves back there 3 more times!! Guest Comment: We had a great time at The Carriage House. We felt so away from it all..but yet very close to everything. The back patio was our sanctuary. And within minutes we could be on Main St. downtown . The Whistle Stop Dinner was a highlight..thank you very much. We enjoyed the bikes & Kyacks you provided and all of your great suggestions of what to do & see in the area. Full bath & shower is located on second floor. Ground Floor bath has a toilet & sink only. Walking distance to Main St. Safety Harbor. Many shops, restaurants & pubs. Nearby parks & marina. All in walking distance. Safety Harbor is a quaint little city with older cottages and new homes. Many historical landmarks. The Safety Harbor Spa is very nearby (3 min walk) . There is a pool, fitness rooms, tennis. guest memberships and day visits are available. The local Chamber of Commerce is a two minute walk away. Safety Harbor Regional Museum is located right next door to cottage. Phillipe Park is 1.2 miles walk down the green way along the Tampa Bay Tandem sit -on top kayak available for guests to use on bay. Mantee watching at marina..5 min walk from cottage .Fishing off pier Main St. Safety Harbor & side streets has several shops & restaurants in a 9 block radius. Very walkable. The Whistle Stop Grill dubbed 'Cheers of Safety Harbor,' is located on Main St. It is a landmark 'Old Florida' restaurant. Serves Beer & Wine and great food..Fried Green Tomatoes & so much more. Old Fashion Ice Cream treats. Music 3-4 nights a week. The Famous Bowling Ball House (seen on T.V ..and travel shows) is also in walking distance. Syd Entel Art Gallery on Main St.
We spent Christmas 2018 here and enjoyed our stay very much. The owners were friendly but gave us our privacy, & the location is in a great area. The house was nicely decorated and very comfortable. The landscaping is also nice. Safety Harbor is a nice destination too. We would definitely stay there again on our next trip. We are glad you enjoyed your stay in Our Carriage House . You are perfect guests and we hope you will come back again . Charming place - great location! Can’t wait to book again for my next trip!! I was a pleasure to meet you and your lovely grand daughter. I'm glad you enjoyed your stay . We look forward to having you stay in The Carriage House again soon. Hopefully a little longer so you can pack in 'more fun'. Beautiful historic Carriage House with all the comforts of home! My husband and I go to Safety Harbor several times a year and usually stay at the local resort. This trip we wanted to stay at a house instead of a hotel and ended up picking the Carriage House. From the moment we stepped into the Carriage House we knew we'd made the right choice. This charming carriage house is full of history with all of the modern touches. The home is comfortable and well equipped, the outdoor patio area is beautiful. Dawn was a wonderful host and even had a nice fruit and chocolate basket for us. We truly enjoyed our time at the carriage house and will definitely stay there again. Adorable Carriage House close to everything in Safety Harbor! This is a unique place that is within walking distance to Main st and everything in Safety Harbor. The carriage house is very large with eating area and a large den. The owners are very nice and helpful. Private parking in back. 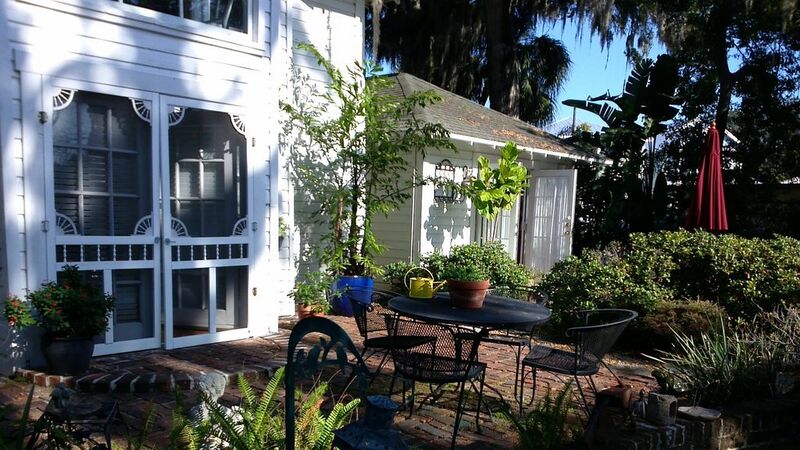 Staying in an old carriage house makes your stay in Safety Harbor more interesting with its adorable charm. I will definitely stay here again!! The House is a Gem, the Town is a Gem! My wife and I have traveled to quite a few Homeaway properties over the years. Our view is that the quality of the accommodations is critical, but so are the immediate area around the property and the property owner. This place scores five stars on all three. The carriage house is charming and roomy. It was immaculately clean and had all the amenities you need. We never knew about the town of Safety Harbor, but it was chock full of nice parks/walkways and great restaurants (including the Whistle Stop, owned by our host :-)). Finally, Dawn, our host, was attentive and helpful; she was a quick text away from being there to answer any questions. Just as a heads up, there is some new construction going next door. Dawn was concerned it would be bothersome to us, but it never entered the picture. The workers never started before we were awake and they were finished by 5:00. Overall, a great experience!!! We needed a place to stay and booked the Carriage House last minute. Dawn and Patrick were very accommodating and pleasant. The Carriage house is so interesting and unique. We felt at home here. Plus the garden is beautiful and a perfect place to enjoy the sun and read or relax. The house is a block from the water and the town. Excellent location. We would definitely stay again. Thank you Judy & Jack. I'm glad you enjoyed your stay . It was nice chatting with you that one afternoon on the patio. You were absolutely lovely guests in every way. The Carriage House is 100 yards from north Tampa Bay, centrally located for the Airport, St Pete Museums, Mall shopping , Clearwater Beach and the quaint town of Safety Harbor itself. The Clearwater Jazz Festival in October is 15 minutes and the renowned Dali museum is 30 minutes. Safety Harbor is home to many artists whose work you will notice in different forms all over town. Don't miss the 'Bowling Ball House'Art Works & Enjoy eating & drinking at 'Whistle Stop Grill (since 1959!) Fried Green Tomatoes & Other Great food..live music. Bike or Walk through Beauiful Phillipe Park on the Tampa Bay. Kyack or Canoe on The Tamapa Bay. Watch the Manatees from the Safety Harbor Pier.. Indulge in yourself at the Safety Harbor Spa .and more ..
Payment: An advanced payment equal to 50% of the rental rate is required upon booking unit. The advanced payment will be applied toward the rent. The balance is due within 30 days of check in. Cancellation: The full amount is non-refundable for cancellations made within 45 days of arrival. Cancellations made 45 days or more to arrival will be refunded less a$50 cancellation fee.